Competence, fairness, openness and entrepreneurial action are in the focus of our attention. We delight our customers with injection moulding machines, moulds, systems and service performances which are marked by reduced total cost of ownership, thus the clearly increased profitability of the investment and by first-class quality. We see ourselves as a team of experts that develops and realizes all processes around the article to be produced. To us the comprehensive advice of our clients and the implementation of their ideas into measurable benefit is not a duty, it is pure pleasure. 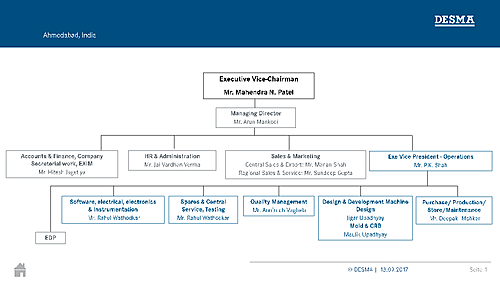 The following chart represents the organizational structure of DESMA India and shows the assignment of the business areas and their personnel.